I’m not retiring any time soon but I think I might be entering a “reflective” phase of life, which probably is the result of being in this (E&O insurance) business over 25 years, and owning and operating OREP for the last 17 or so. I began as a one person shop, working out of my back bedroom, with not a single insured. Today we have 11 employees, many of whom have built or are building their careers here, and we carefully handle the insurance for over 8,000 clients, a good number of whom are home inspectors. Here are some tips for what I believe have helped us build a successful company. I think they will help you too. Honor your word: do what you say and say what you do. Be grateful for health, love, and for whatever success you may enjoy. It’s not all you and it’s not all your hard work; I can recall many periods in my life where I worked very hard with very little or no success—maybe you can too. 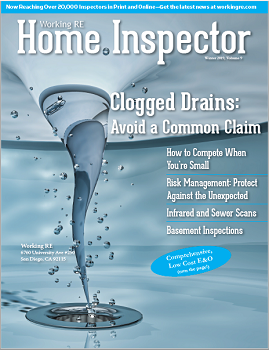 Regarding our publication, Working RE Home Inspector (which I love), I’ve always written honestly about what I think our readers would be interested in as home inspectors and small business owners (takes one to know one). If it’s interesting and useful to me, chances are it will be for you, too. We are all in the customer service business, which as it turns out, I also love. What makes good customer service? Efficiency; clear, honest communication; competency and (again) treating others as you would like to be treated. We’ve all heard those types who do plenty wrong but who insist that they “did nothing illegal.” That is not the way to run a business (or anything). I respect the law and the rules but I don’t use them as my minimum standards for running my business. I try to do what’s right (how I would expect to be treated), whether I am required to or not, whatever the “cost.” And it hasn’t hurt my business; it’s helped it. I’ve always lived below my means, which gives you choices. I believe in a work/life balance for myself and for everyone who works at OREP. The work will be there tomorrow but your family and friends might not. I’m grateful for everything (that’s worth saying twice). But what does that really mean? It should mean more than just words. To me, it means honoring every question, returning every phone call or email, saying thank you and meaning it, being patient—trying to do the right thing. Caring for everyone who entrusts their business with you. Listen to your customers—they tell us how to succeed. If you have staff, listen to them for the same reason. Keep an open mind, consider advice, take criticism seriously, be on the lookout for things to help you solve your problems and then use your intuition to recognize the solution when it reveals itself. Then be nimble and quick to make the change. I once read that in business, you can’t stand still: if you’re not going forward you’re going backward. I’m very conservative by nature—slow to change. While stability is a good trait for an insurance agent, it’s not so good for succeeding in a small business. So, I compensate by reading what I can on customer service, marketing, what motivates people, how to be a good employer, how to reduce risk for my insureds. Given my nature, learning to constantly seek improvement through change was very hard for me to put into practice at first—now it’s exciting. Hard work, effort, is never wasted. If something you work hard for doesn’t come to fruition, try to figure out what there is to learn—to be better prepared for next time and figure out what not to do. As a writer every story is a struggle to bend a handful of words into a clearly communicated idea, but every attempt makes the next story a little easier to write—whether the story ever sees the light of day or not. Every insurance policy not sold lays the groundwork to try again next year if you’ve done your best. I imagine it’s the same for inspecting. It feels good (not bad) to admit that you made a mistake. It’s the most liberating experience in the world. And I’ll save the first for last: I believe that faith in something bigger than ourselves and our own interests is a loadstar that keeps us headed in the right direction and gives us something to lean on in times of adversity— which is a given in business and in life. Thanks for reading. David Brauner is Publisher of Working RE magazine and Senior Broker at OREP, a leading provider of E&O Insurance for appraisers, inspectors and other real estate professionals in 50 states (OREP.org). 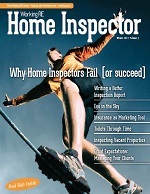 He has provided E&O insurance to appraisers for over 25 years. He can be contacted at dbrauner@orep.org or (888) 347-5273. Calif. Insurance Lic. #0C89873. 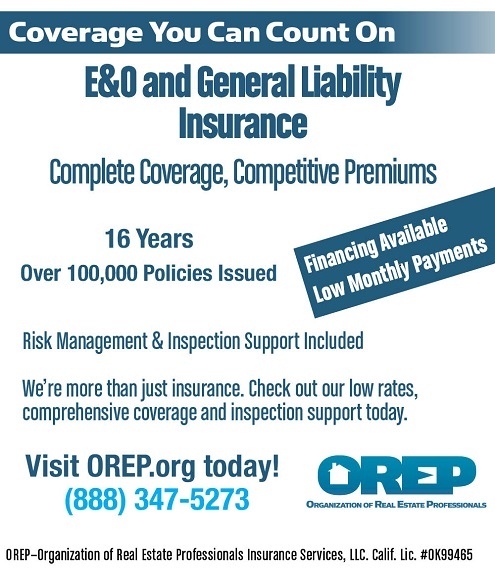 Visit OREP.org today for comprehensive coverage at competitive rates. David, Great reminder about what life is really about. Keep up the great work!